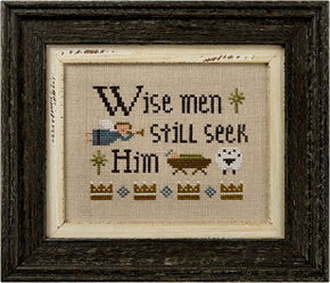 "Wise Men Still Seek Him" Perfect for the true spirit of the season. This timeless design stitches up quickly, but you'll enjoy it for years to come! Design size: 4.5" x 3.5" Instructions given for Weeks Dye Works threads with conversions for DMC embroidery threads (not included). Model stiched on 30 count Lambswool linen by Wichelt Imports, 2 over 2, (not included, sold separately see item 31-150).